Before USD 423,00 IVA Inc. 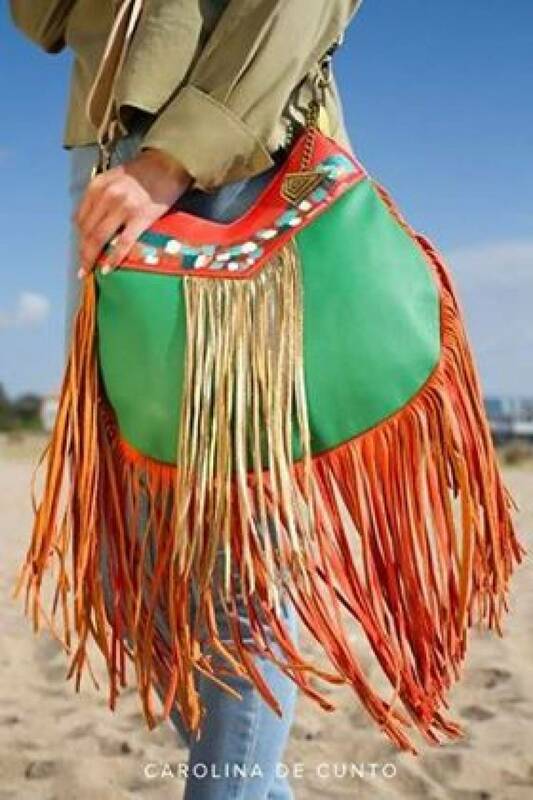 This is a juvenile, stylished & fringed leather cross-body bag that everyone needs in their wardrobe, great combination of style, colors and textures. This is art to wear: hand painted art design detail in front accompany of combined vibrant colors and long fringes makes this tote a one of the kind bag to impact. Wear it casual as a cross-body or short by the waist. Detail of hand painted art. Fully lined with with Carolina's design pattern fabric.This is 100 % finished top quality, handmade selected bovine leather. - Adjustable strap, for shoulder or cross-body wear. - Measures 14 1/4 " (L) x 16 1/2 (H). - Available color: Coral , Green long fringes and detail of handpainted art at front.